DOGdex ID is a DNA based ID system for dogs intended to help return lost dogs back to their owners operated by Mr Dog Poop, Inc a Florida Corporation. The program allows anyone to purchase a DNA collection kit and return the saliva/buccal swab to our DNA lab for processing. That DNA and information provided remains on file the life of the dog or a term not to exceed 20 years which ever is shorter. When a dog is lost, it is reported on one of our websites, either dogdexid.com or mrdogpoop.com and the data on file will be checked against any reported found dogs and new registrations in an effort to find the lost dog and notify the owner of its location. The program is an ID program only and cannot guarantee the safe return of any dog only that the DNA profile will be used to help with the identification of the dog. As a new program, the acceptance of the DOGdex ID has not been adopted nationally and requires municipal participation for the most effective program. If your municipality requires a DOGdex ID, your dog is likely to be identified when lost and found in any shelter. For those living in a municipality that has not adopted DOGdex ID as a requirement, we are working to make that happen and need your support. The benefits of having a DOGdex ID to identify your pet in any custody dispute, proof of ownership to a shelter, should the dog get lost, or having a piece of mind, that you have digital DNA on file if ever needed for any reason. 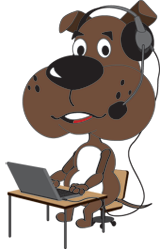 Each DOGdex ID includes online access to update owner contact information or the status of ownership of the dog. When dogs are adopted by new owners, you must update the DOGdex ID Profile or when the new owner tries to register the dog, it will comeback as stolen tracking back to the original owner. DOGdex IDs are fully transferable to new owners, so the dog never has to be tested again, but ownership information does need to be updated online. ID Cards can be printed FREE online from your DOGdex ID account or laminated cards can be ordered from our online store for a small fee. The information provided to Mr Dog Poop Inc to run the DOGdex ID program will not be shared with outside parties for the purpose of advertising or marketing. The information will be used and shared with municipalities and their assignees as needed in the execution of animal control, law enforcement, municipal licenses and contracts or other activities associated with managing dogs within each municipality. Further, DOGdex Serves as a National database for law enforcement and law enforcement agencies do have access to match dog DNA profiles from their own labs. If your dog is involved in a criminal act, your contact information will be shared with the legal authority seeking the information. This is done though digital finger print matching ONLY. It is not based on any data, owners names, phone numbers or other information provided and can only be accessed when a DNA match is made. Information is stored on a secure network with 256 bit encryption which is the current standard for the storage of personal data. We do not store or ask for social security numbers, bank account information or any financial information other than the original purchase of the ID. DNA technology is very complex and our DNA profiles are only as good as the DNA samples we are sent. If 2 dogs are sampled while licking each others faces, there can be a mix of both dogs DNA making matching impossible. DOGdex Is not responsible for DNA mismatches where the original DNA sample was not collected and submitted properly. DOGdex ID reserves the right to ask for a retest and will send a kit at our cost for retesting if we feel that an ID was not complete or in some way not successful in the DNA analysis process. Because kits are transferred via mail and outside shipping companies, DOGdex ID is not responsible for lost or missing IDs during the mailing processes and will, if needed, send out new sampling kits to replace the lost or missing DNA samples.